The voice of the man in knee-high boots and a wide-brimmed crimson hat boomed as we entered the castle walls. Right from the beginning, it was clear this was no ordinary place. 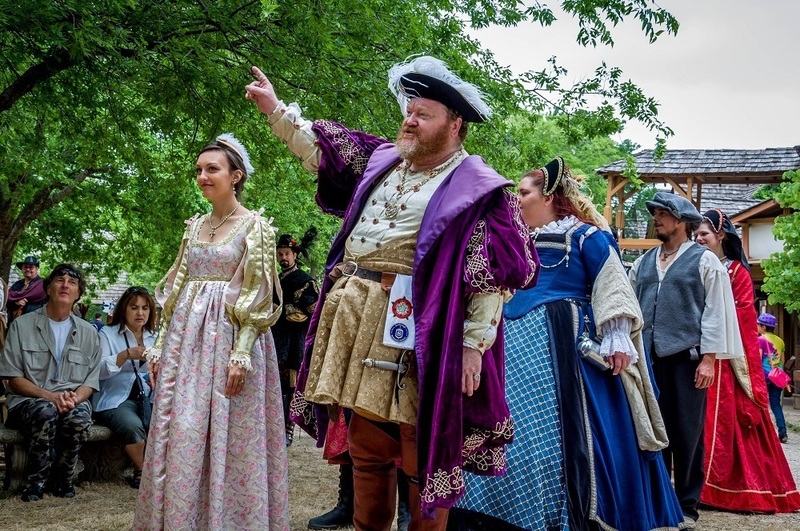 We crossed the threshold into Scarborough Renaissance Festival and immediately laid eyes on dozens of lords and ladies in the finest brocades and flourishes of 1533 England. 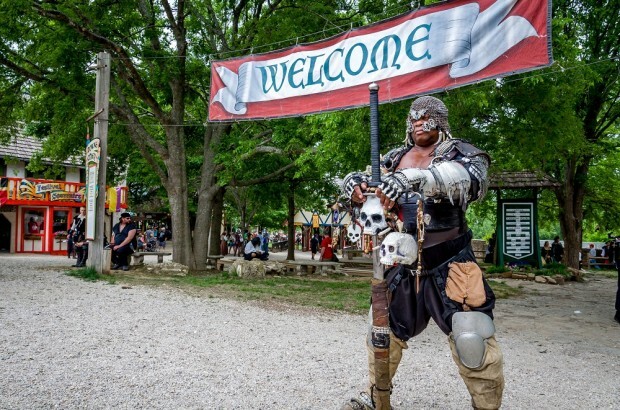 Everywhere we looked, there were swords and capes and grand headpieces worn regally by cast members and guests alike, despite the heat and humidity of the late spring afternoon in Waxahachie, Texas. Since I grew up in Dallas only 45 minutes away, this was not my first trip to the wondrous fantasy world of Scarborough Renaissance Fair, but it was my first visit as an adult. As a child, I dressed up (my favorite was a sparkly pink princess dress that somehow came with wings), rode rides, and got my face painted in the brightest colors around. 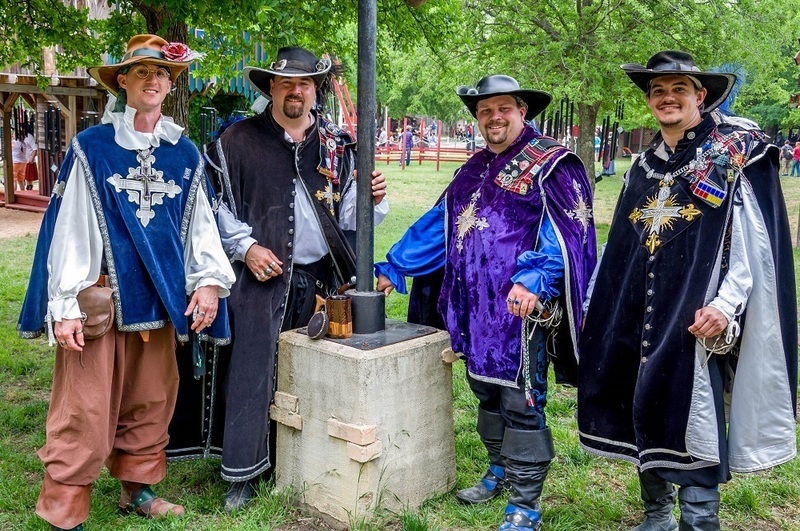 But this visit was all about discovering what parts of the Faire would appeal to a slightly more grown up audience. 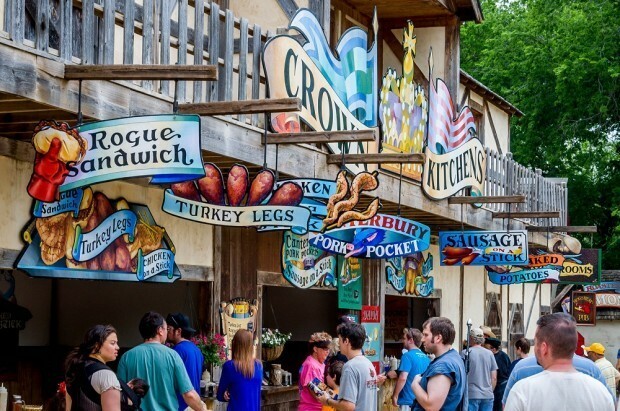 The 35-acre Renaissance festival offers hundreds of things to do, but for those over the age of 21, we have a few particular recommendations. As you trudge through the field (aka parking lot) from your parking spot to the entrance, you see normal activities–parents putting kids in strollers, adolescents applying sunscreen, adults taking last minute swigs of water…and other beverages. But the unexpected thing is that you also see people getting dressed. There are hundreds of lively festival staff dressed in elaborate, multi-layered costumes. But visitors give the employees a run for their money, so much so that staff wear a small, unobtrusive badge to separate them from the everyday visitor. These “playtrons” are painstaking in the creation of their costumes and characters. There are jesters, lords, pirates, and wenches, among many others. You’ll even see a few fairies and even a Harry Potter or two thrown in for an anachronistic variety. You can come to Scarborough Faire with your own costume or buy from one of the many shops inside. Pretty sure I’m going to have to invest in the fun on my next visit. 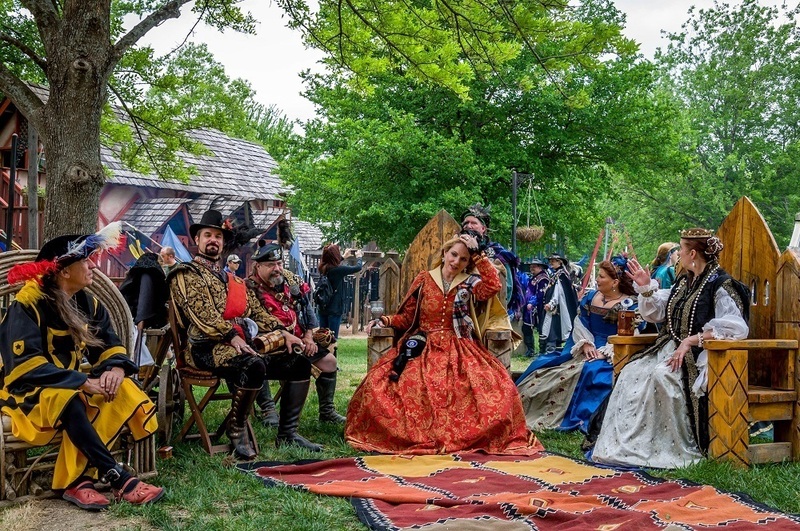 The Faire hosts 200 performances a day, so at any given moment there are a number of shows taking place throughout Scarborough Renaissance Festival. Whether you’re interested in comedy, acrobatics, or birds of prey, there are more than a few shows worth taking in. If sword fighting, knife throwing, or things involving fire are more to your liking, you’re in luck there as well. Three times a day, there are full combat jousts. 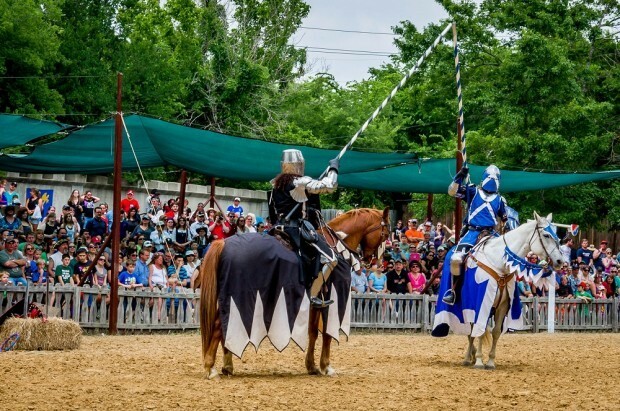 Four knights on horseback run at each other, spurred on by the cheers of the crowd and the ladies of the realm. It’s part theater, part “bleeding for your sins” in dramatic fashion. Arrive early to get the best views. As a bonus, many of the show areas are a great place to rest your feet, and many of them are covered. This is ideal because if you’re anything like us, you may be a bit tired from walking all day, and it’s nice to have a break from the Texas heat. Some of the shows are a little more PG-13 than G-rated. Twice a day every weekend, Flynn Markley (aka The Wine Shark) hosts wine tastings behind the Cat and Fiddle Pub. He and his assistant take the audience of about 30 on a tour of a different wine region each weekend. Tastings have focused on areas like Spain, Germany, Italy, and South Africa. Regions can be broadly defined, as our tasting essentially featured wines from around the Southern Hemisphere. I thought I knew a fair amount about wine tasting, but I was wrong. Flynn is funny, and he knows his stuff. Our tasting included tips on how to taste wine — the 4Ss of see, swirl, smell, and sip — and educated descriptions of the various grapes and qualities of the wines. He never even breaks his Renaissance character. The wine tasting was a lot of fun and I feel smarter for having been. 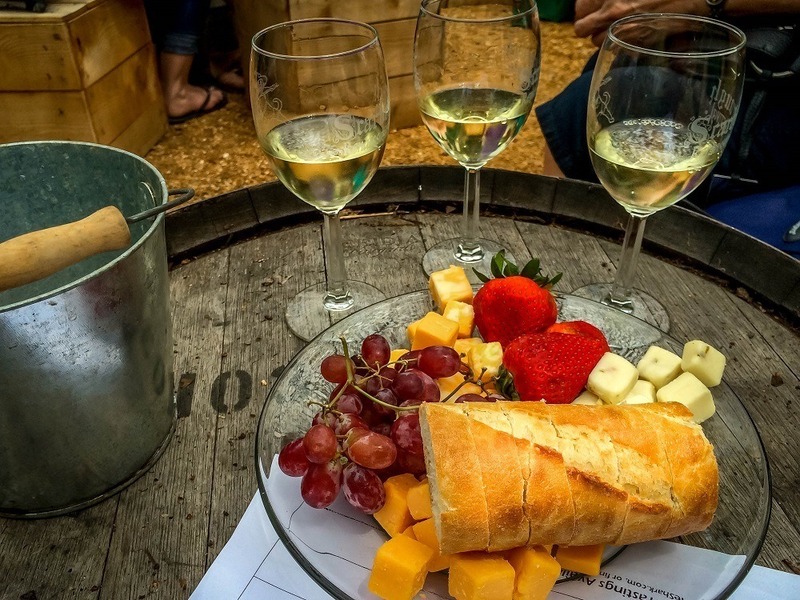 The $30 ticket, which is separate from the festival admission, includes 6 generous tastings (about 2-3 glasses of wine) during the one-hour event, a souvenir wine glass, and the tasty bread, cheese, and fruit platter. Flynn even shared his friend’s homemade goat Gouda. Truly an event not to miss. 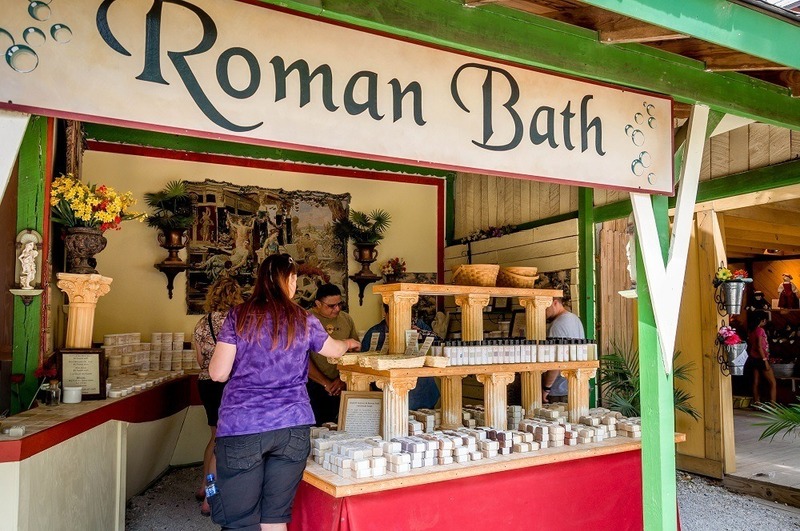 With more than 200 shops at the Waxahachie Renaissance festival, it’s hard to imagine much that you can’t find. Looking for custom made sandals or moccasins? 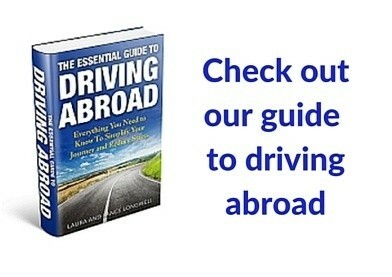 You’re covered. Hoping to find candles and soaps to address the Renaissance “scent” (thank goodness bathing is a regular thing now)? There are several options. You can also find lots of choices for jewelry, pottery, musical instruments, and kids’ items. Browse while noshing on items from one of the nearby food stands, and your day will be complete. 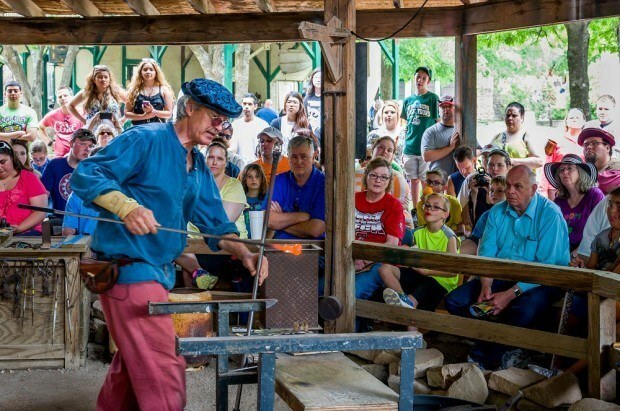 One of the demonstrations I remember most vividly from my previous visits to Scarborough Renaissance Festival is the glass blowing. Regardless of your age, it’s hard not to be in awe of a vase or bowl taking shape before your eyes, especially when that item is being super-heated in a glowing orange furnace, and the guy doing it is going about his business like he’s doing nothing more complex than making a sandwich. The glass blower who demonstrates his craft four times per day is one of several very knowledgeable artisans at the Faire. Somehow, they deliver detailed, engaging descriptions of everything they’re doing while entertaining the audience and not missing a beat. 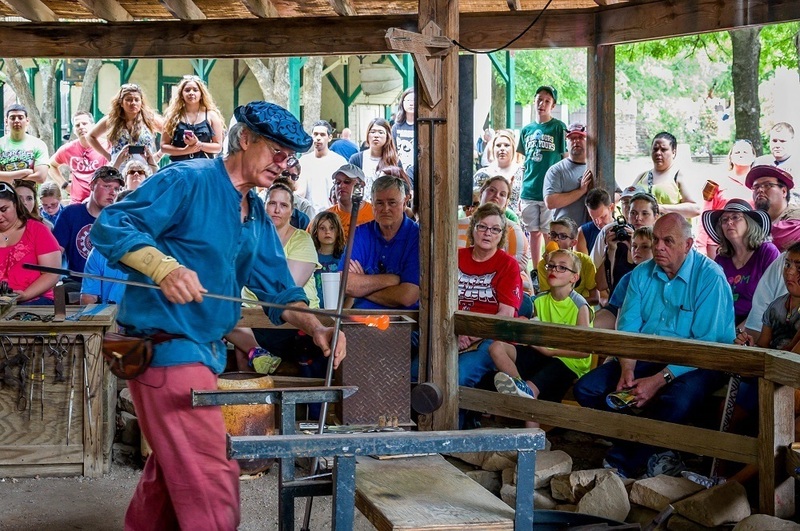 In some instances — especially like glass blowing and blacksmithing — these crafts seem pretty darn dangerous. I mean, have you seen how hot a blacksmith forge can get? And yet, it’s all done seamlessly with the mark of educated showmanship. 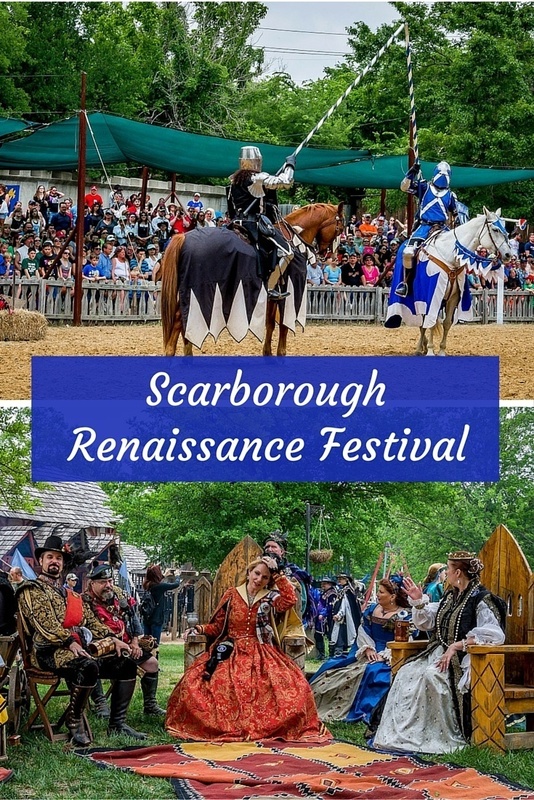 And here’s the thing you might not expect from an event like Scarborough Fair — the food is good, and it’s reasonably priced. No rubber chicken or shoe leather hamburger here. The turkey legs (a festival signature—they sell 20 tons per year) are juicy, the chicken is tender, and the ice cream is amazing on a hot Texas day. You can pair any of these with a variety of Dr. Pepper products (it’s Texas, people!) or wine, beer, and margaritas throughout the grounds. The five food court areas throughout the festival have pretty much anything you can imagine. Even at peak times, the waits are relatively short. The staff has clearly got catering to hungry aristocracy down to a science. The festival takes place in Waxahachie, Texas, every weekend from early April through late May and on Memorial Day Monday. Adult tickets are $28, and tickets for those under age 12 are $13. 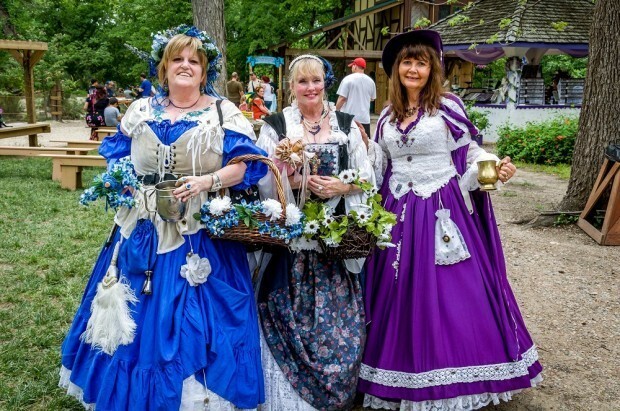 We were guests of Scarborough Renaissance Festival. Opinions of the entertaining, opulent, and alcoholic are our own. 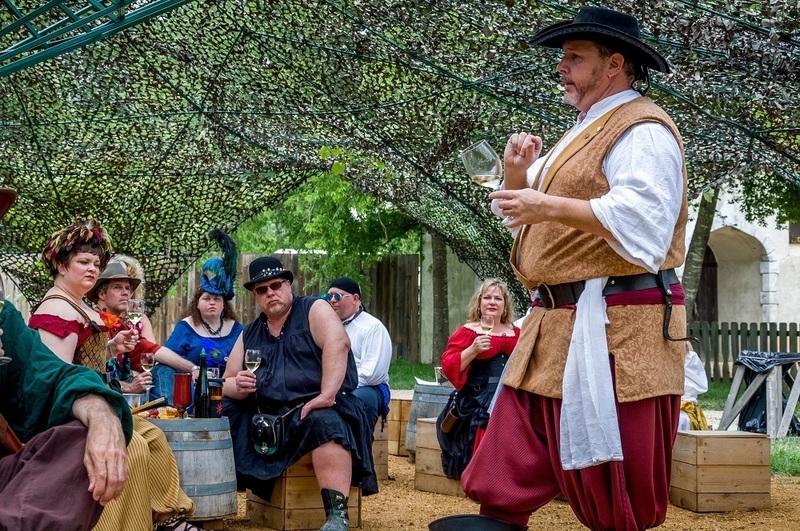 What do you think about Party Like It’s 1533 at Scarborough Renaissance Festival? I’ve always wanted to go to a Renaissance festival! I’m going to have to look into some this summer. I love Renaissance faires, always a lot of fun! Great article about Scarborough! Wine tasting is always good! You’re most welcome. 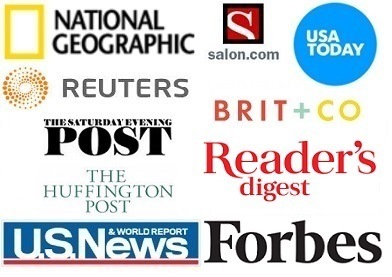 We appreciate your kind words about our article.